Many enjoyable nature outings have sent people home with a rather unpleasant souvenir. Some 10 to 50 million people in the United States are affected by poison ivy each year. In fact, this poisonous plant constitutes the single most common cause of allergic reactions. When you come in contact with the toxic leaves, stems, or roots of a poison ivy plant, it can give you an unbearable itchy rash. Other common symptoms include blisters and pain, and occasionally there may be intense burning, inflammation, and fever. You must try hard not to itch the rash as it can irritate the reacting skin and potentially lead to infection. It’s also important to keep the affected areas clean. A poison ivy rash will eventually go away on its own, but the itching can drive a person absolutely mad. 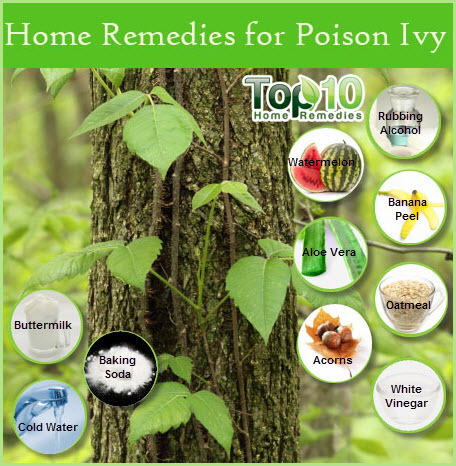 There are several home remedies that effectively alleviate the various symptoms of poison ivy. Here are the top 10 home remedies for poison ivy. Rubbing alcohol is a solvent containing 70 percent isopropyl or absolute alcohol and is used as a topical application. It has disinfectant, soothing and cooling properties that can help get rid of the symptoms of poison ivy. It also sterilizes the affected skin and helps prevent infection. Spread rubbing alcohol over the affected area and wrap it with gauze. Do this several times a day for two to three days. If you apply rubbing alcohol immediately after coming in contact with the poisonous plant, it can help slow down and minimize the extent of the rash as well as your discomfort. Banana peel can also come to your rescue due to its soothing and cooling properties. This remedy is very helpful if you have blisters that have broken open. Peel the skin off a ripe banana. Rub the inside of the peel on the irritated skin area for instant cooling relief. Repeat the process two or three times a day. The avenanthramides and phenols present in oatmeal contain anti-inflammatory properties that help reduce inflammation caused by the skin’s reaction to urushiol, the substance in the poison ivy plant that irritates the skin. Boil oatmeal in water, allow it to cool for a few minutes, and then apply it to the affected area while it is still warm. Let it dry on its own and then wash it off with lukewarm water. This simple remedy will give you relief from itching. Alternatively, add a few tablespoons of oatmeal powder to warm bath water and soak the affected skin area in the water for about 30 minutes. This helps dry out a rash that has started to blister, and also relieves the itching. It will also soften and moisturize your skin, which helps lock in moisture and protect skin from exterior irritants. White vinegar’s acid content can help prevent a poison ivy rash from spreading. A cold vinegar compress will dry out the rash as well as reduce itching. Mix one-half cup of white vinegar with one and one-half cups of water. Chill the solution in the refrigerator for a couple of hours. Moisten a cloth in the solution and press it onto the affected skin area for two minutes. Wait a few minutes and then repeat. Do this for several minutes once daily for a week or two. Another classic homemade cure for poison ivy is baking soda. Baking soda is a good drying agent and has anti-inflammatory properties that can help reduce the itching and inflammation associated with poison ivy. Mix three teaspoons of baking soda with one teaspoon of water to make a thick paste. Apply this paste to the rash and allow it to dry. Then rinse it off with cold water. Do this three times daily to speed up the healing process. Another option is to take a soothing baking soda bath. Simply pour a cup of baking soda into lukewarm bathwater and stir it gently. Soak in the bath to relieve your symptoms. Watermelon rind acts as a cold compress, and the juice helps dry out blisters. Gently rub chilled watermelon rind over the rash. Let it dry on its own. Do this three or four times a day until you notice improvement. Alternatively, mash some watermelon along with the rind and chill it in the refrigerator for one hour. Apply the paste to the skin and let it dry naturally for soothing relief. Do this several times a day. Aloe vera’s anti-inflammatory and antibacterial properties can help reduce poison ivy symptoms. 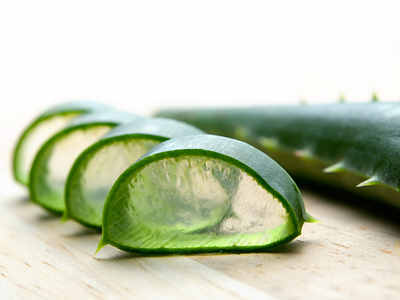 Simply slice a leaf of a fresh aloe vera plant, extract the gel and apply it to the affected areas several times a day. This will give you instant relief from pain and itching. If you do not have an aloe vera plant at home, you can buy a bottle of the gel from the store. Make sure it is at least 90 percent real aloe vera. 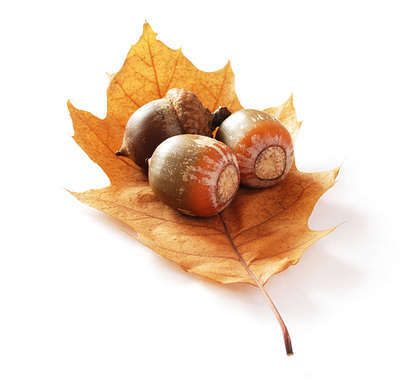 Acorns have antiviral and antiseptic properties that can be used to treat skin rashes and irritations, minor burns, cuts and abrasions as well as poison ivy. Boil some fresh cracked acorns in water for several minutes. Strain out the nuts and allow the tannic water to cool. Dip a cotton ball in the solution and apply it on your rash. Note: You can also freeze the tannic water in ice cube trays and use the cubes as cold compresses on the affected area. 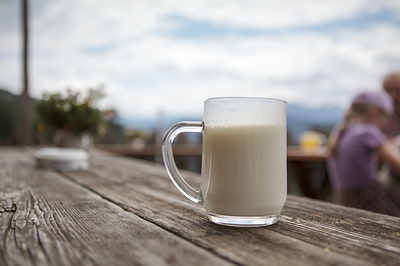 The high protein content in buttermilk will help draw out fluid from blisters. It also has soothing properties that will give you relief from itching. Mix equal parts of buttermilk, vinegar and salt. Rub this mixture on the affected skin area. Although it is a little painful, this remedy will help dry up the rash quickly. Also, it will help stop itching and soothe the skin. Alternatively, you can add some buttermilk to warm water and then use it to wash the affected skin area. This can be very soothing on itchy skin. Do this once daily. Using cold compresses immediately after coming in contact with the poisonous plant can help minimize the size and severity of the developing rash. They also will reduce itchiness. Simply dip a cotton ball in very cold water, dab it on the affected area, and let it air dry. Repeat as needed. You can also wrap some ice cubes or a bag of frozen vegetables in a towel and apply it to the affected area for a few hours. Repeat again after two hours. Never apply ice directly on your skin. 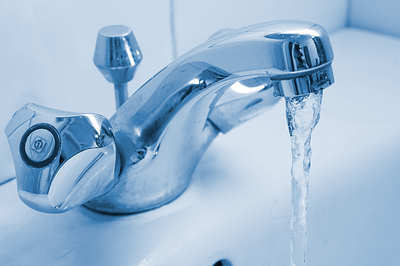 You can also keep the affected area under cold running water for 10 to 15 minutes. Try these remedies at home to get relief. But if you are in extreme discomfort, or you develop blisters along with swelling or redness on the affected skin area, seek medical attention. Plain old vinegar removes the itch from poison ivy. Jewelweed used as a compress will naturally rid poison ivy. You may also use the tea from this plant and mix into either hand soap or a lotion.